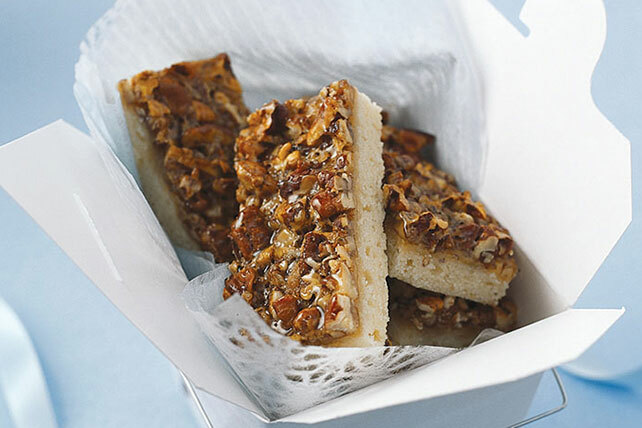 Discover a delicious holiday dessert with our Pecan Bars recipe. Layer creamy pecan pie filling on top of a crispy cookie crust to make these luscious Pecan Bars which are perfect for your upcoming party. Combine flour and baking soda. Beat cream cheese and 3/4 cup butter in large bowl with mixer until blended. Add granulated sugar and 2 tsp. vanilla; mix well. Gradually add flour mixture, mixing well after each addition. Refrigerate 30 min. Heat oven to 350°F. Press dough onto bottom of 15x10x1-inch pan. Bake 20 min. or until lightly browned. Meanwhile, melt remaining butter; pour into medium bowl. Add eggs, brown sugar, corn syrup and remaining vanilla; mix well. Stir in nuts. Spread nut mixture over warm crust. Bake 20 to 25 min. or until topping is firm around the edges but still slightly soft in the center. Cool completely. These tasty bars make great treats to serve at a holiday party or to share at a cookie exchange.